They are arrested at Frogmorton. Gandalf's enigmatic words as he left the hobbits were, "I am not coming to the Shire. You must settle its affairs yourselves; that is what you have been trained for. Do you not yet understand? My time is over: it is no longer my task to set things to rights, nor to help folk to do so. And as for you, my dear friends, you will need no help. You are grown up now. Grown indeed very high; among the great you are, and I have no longer any fear at all for any of you." Perhaps the poor Shirriffs at Frogmorton would have liked to have known this before they "arrested" our hobbits, in order to avoid the comic parade out of town. The downward story arc of The Return of the King might also be called "The Return of the Hobbits" as they retrace their steps home. For these are not the same simple hobbits who left the Shire the year before. Sam in particular has assumed more authority--the beginning of his political career? The Return is not just a geographic return, however, but also a linguistic one, as the language and names of the hobbits seem all the more rustic after the high and formal language of Minas Tirith. They come to Bywater and rouse the Shire-folk. But in the midst of all the martial preparations, Frodo reminds his fellows of the lessons of mercy he has learned from his Quest, even mercy for Lotho, whose greed and power-hunger paved the way for Sharkey's takeover. He says, "But remember, there is to be no slaying of hobbits, not even if they have gone over to the other side. Really gone over, I mean, and not just obeying ruffian's orders because they are frightened. No hobbit has ever killed another on purpose in the Shire, and it is not to begin now. And nobody it to be killed at all if it can be helped." Battle of Bywater, and Passing of Saruman. End of the War of the Ring. Only just a year after their month spent in Rivendell before setting out on the quest to destroy the One Ring, the four now greatly changed and matured hobbits finally put an end to The War of the Ring at the Battle of Bywater. The ruffians are routed and the devastated Shire returned to the care of the hobbits themselves. More importantly, and significantly comes the death of Saruman at the hand of Wormtongue who slits his throat and then himself is killed by hobbit arrows. To the dismay of those that stood by, about the body of Saruman a grey mist gathered, and rising slowly to a great height like smoke from a fire, as a pale shrouded figure it loomed over the Hill. for a moment it wavered, looking to the West, but out of the West came a cold wind, and it bent away, and with a sigh dissolved into nothing. But now there is time aplenty. 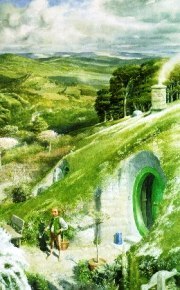 Images © "Bilbo at His Door" by Alan Lee.